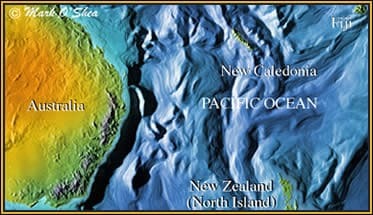 Location: New Caledonia is located 900 miles east of Australia. New Caledonia is located 950 miles east of Australia and it possesses a very different and unique fauna from that of its huge continental neighbour. 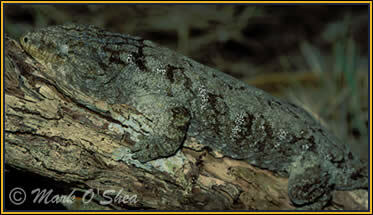 Amongst the herpetofauna (reptile fauna) of these remote islands are a group of six species of giant geckoes, the largest living geckoes in the world. Mark joins Prof Aaron Bauer, a world authority on geckoes with 16 previous visits to New Cal. under his broad belt, in search of the giant geckoes on a group of isolated islands off the south coast. They aim to compare the DNA from these specimens with DNA from their closest mainland New Cal. relatives in order to determine whether they are actually separate species. If they are, it will help the authorities legislate to protect the island populations from over-collection and habitat destruction. The largest of the giant geckoes is Leach’s giant gecko, Rhacodactylus leachianus, which is reputedly the only gecko in the world that growls ! This strange nocturnal call may be one of the reasons why some locals consider the giant geckoes to be ‘devils in the trees’. The flabby-skinned Leach’s giant gecko (Rhacodactylus leachianus) is the largest living gecko in the world, and the only one said to ‘growl’.